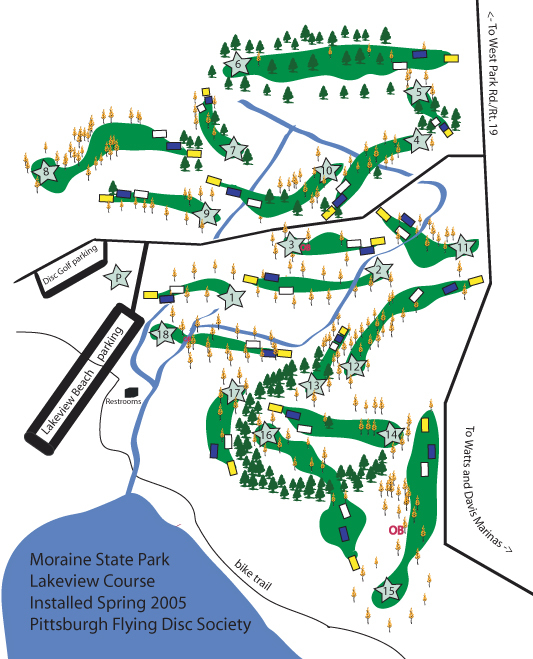 Lakeview Disc Golf Course - Attractions | Visit Butler County Pennsylvania! The Lakeview course is a par-66 championship level course, with two par 5s, eight par 4s, and eight challenging par 3s. The course features a set of Gold tees, rated at 1000, Blue tees, rated at 950, with a set of beginner-friendly White tees (900) also marked. Hole distances are measured from tee to green center. The course was opened to the public in Spring of 2005 and was designed by Keith Clark, Chris Deitzel, J. Gary Dropcho, Leo Liller, Bryan Wright and Tim Wright. Accuracy is a must, both off the tee and on approach shots. Bad shots are penalized and good shots rewarded. The views and scenery on the course are spectacular, and the fairways covered in grass, ferns or carpets of moss. Most holes have an elevated tee or green and fairways are mostly open with many well positioned trees guarding greens. Know what poison ivy looks like and take water on the course. A round of golf at Moraine is a strenuous but rewarding workout. From Memorial Day to Labor Day, a beach and snack bar are open; most of the year, bikes and canoes and modern cabins can be rented; hiking, wind surfing and fishing any time you want. The Department of Conservation and Natural Resources has done an excellent job of installing and maintaining this disc golf facility. Note that the park has a carry in/carry out trash policy.